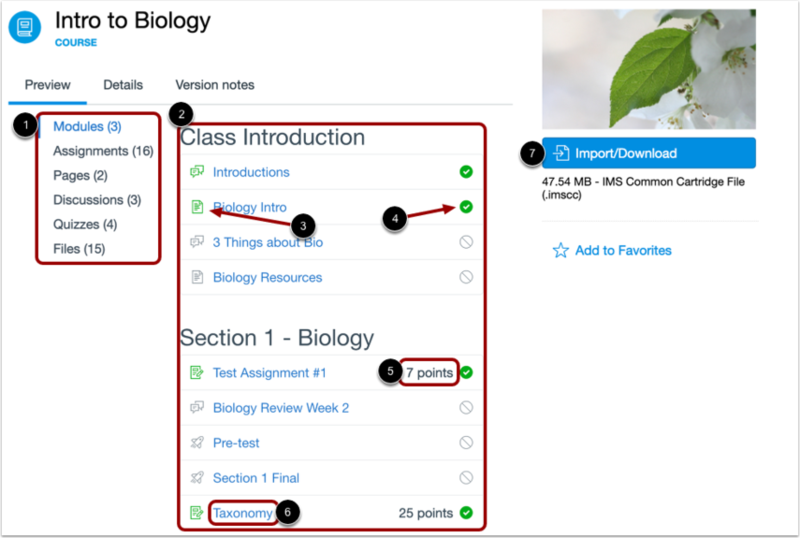 You can preview resources in Commons before importing the resource into your Canvas course. 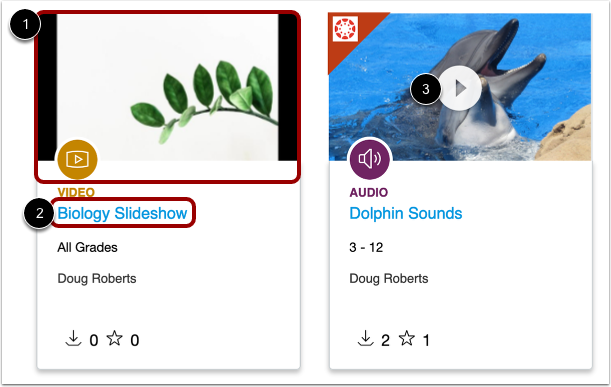 In the search results, you can preview video and audio files for up to 10 seconds. Learn about supported file types in Commons. Resources can be opened in a new tab by pressing Command (Mac) or Control (PC) while clicking the resource name in the Search page, or, by right clicking the name of the resource. You can also filter search results . Learn more about searching in Commons. 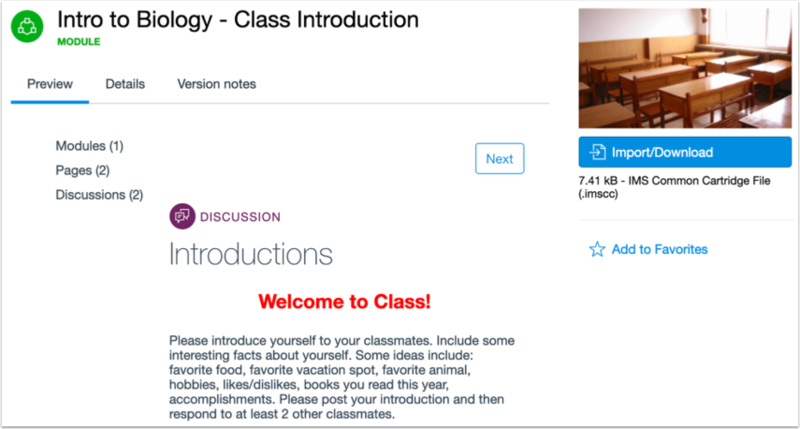 To preview a course, click the course title. In the course details page, you can preview the various learning activities within the course. 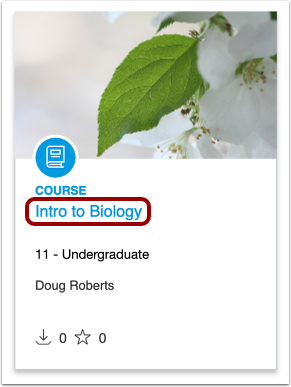 To preview course content, click a section in the sidebar . Content is listed in the preview area . Each content item displays the content type icon  and the published status icon . If applicable, points possible are also shown . To download the file to your computer, click the Import/Download button . Note: If a course does not contain a particular learning activity (e.g. quizzes), it will not be included in the course details. 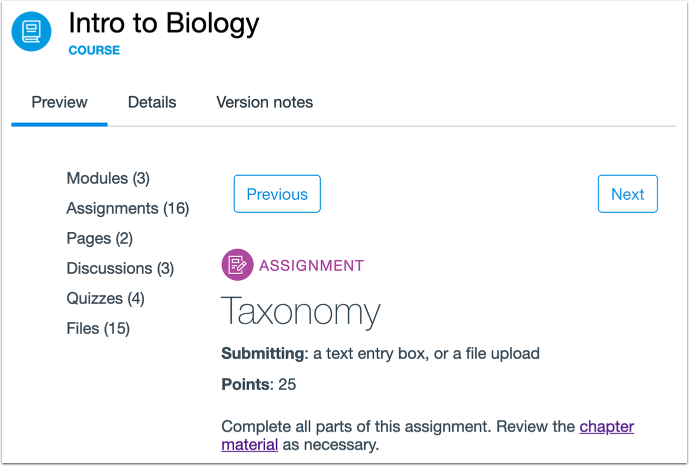 Content item previews can include the item's title, description, submission requirements, points possible, links, and attachments. Information provided in the preview depends on the type of content being previewed. 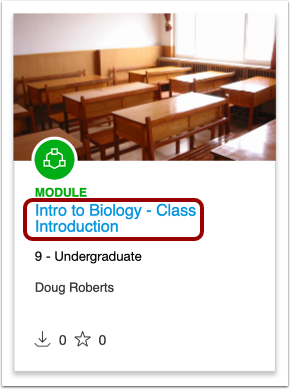 To preview a module, click the module title. In the module details page, you can preview items in the module. To preview module content, click a section in the sidebar . Content is listed in the preview area . Each content item displays the content type icon  and the published status icon . To preview a content item, click the item title . Content item previews can include the item's title, description, submission requirements, points possible, links, and attachments. Information provided in the resource preview depends on the type of content being previewed. In the search results page, click the title of the document  or image  you want to preview. Note: Some image thumbnails are cropped automatically. 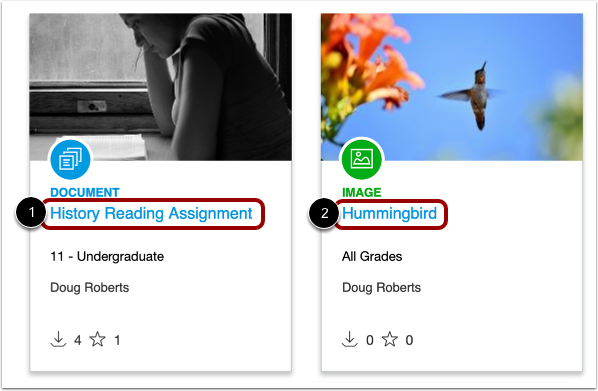 In the resource details page, you can preview the image or document before importing it into your course . You can also view the file type and size . To import the file into your course or to download the file to your computer, click the Import/Download button . In the search results page, you can preview video and audio files (up to 10 seconds). 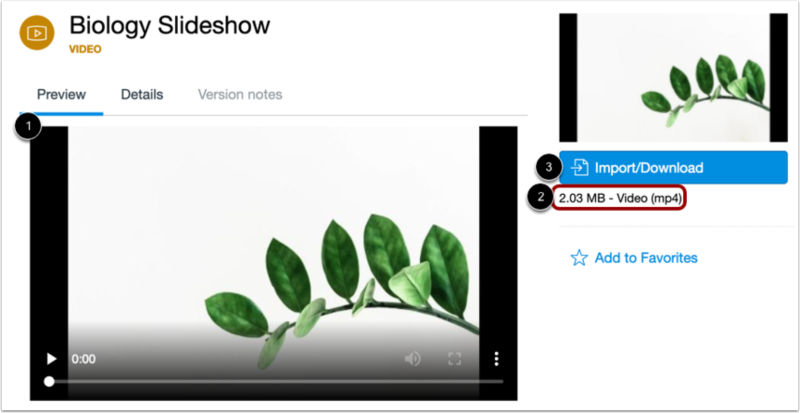 To preview a video, hover your cursor over the video thumbnail ; the video preview will play automatically. Audio is not available when previewing a video. To view the full video with audio, click the video resource title . To listen to a preview of an audio file, click the Play icon . 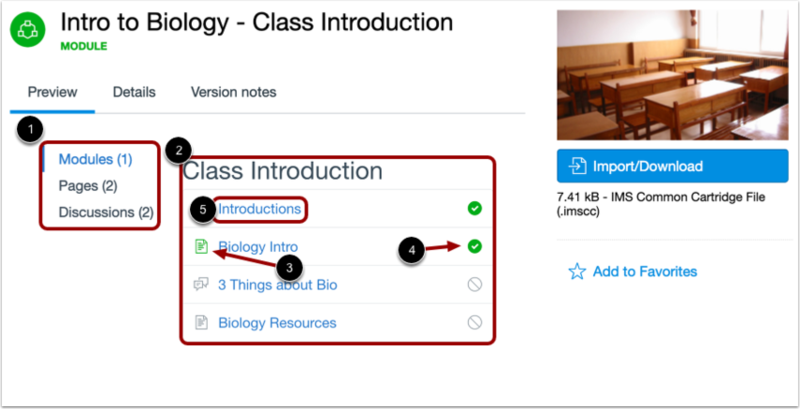 In the resource details page, you can preview the full video or audio file before importing it into your course . You can also view the file type and size . To import or download the file, click the Import/Download button . Previous Topic:How do I use Commons? Next Topic:How do I import and view a Commons resource in Canvas? Table of Contents > All Users > How do I preview resources in Commons?